Ensure flowing water is available outdoors throughout the winter using the K&H Red Heated Rubber Hose. This lasting, heated water line allows you to complete all your outdoor watering needs, even in freezing weather. An integrated heater within this double walled, rubber hose uses 200 Watts of power to gently warm the line, keeping water free of ice and flowing. Its 40' length is great for many of your home, jobsite, or farm watering needs, and the 78" long cord makes powering the item simple. The hose may remain plugged into a standard, 120 Volt outlet all winter, and the heating element is thermostatically controlled, automatically turning off during warmer weather. The 5/8", solid brass couplings attach to standard outdoor spigots, and the included washers ensure a watertight seal. The rubber construction forms a hardy line, while its red color indicates its heating function. 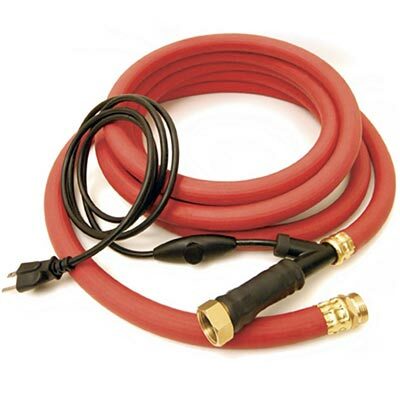 Prevent the water in your garden hose from becoming icy with this Red Heated Rubber Hose. Two year limited warranty.